15 Teaching Aids and Course Supplements that are included as part of your core training in the Asheford Program. In addition to the Asheford core-curriculum, students will also receive 15 Additional Teaching Aids and Supplements that are designed to be used in conjunction with your overall Course studies. These supplements and teaching aids, offered in hard-copy or online formats, (depending on Course selection type), are included as part of the Asheford Program at no additional cost, and are designed to support and augment your Course studies and training. All of these supplements have been carefully chosen so as to provide the maximum amount of benefit to students working and training in the field of antiques, collectibles and appraising. They have been added to the Asheford Course to not only enhance the curriculum, but to also provide students with a wider scope of potentially helpful options when it comes time to operating their own businesses. The Supplements listed below, are "inclusive" of the Asheford Program, and are provided at no additional charge. .
1. 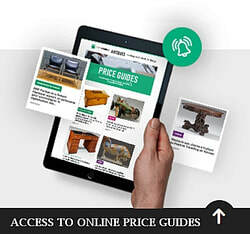 Free Price Guide(s) directory - listing the latest antique prices. 4. A Free Newspaper Subscription to a leading antique publication. 5. A Free Book on Antiques, Collectibles or Memorabilia. items and the decorative arts. 8. An official Membership Card from the Asheford Institute of Antiques. that guide you in setting up a successful business. appraisals through actual examples sent in by students. *NOTE: On Monthly Tuition payment accounts,Teaching Aids and Supplements are only released in installments, and are included with the shipping of Textbooks or the release of e-Course Plans. All applicable e-Course Teaching Aids are provided in an online format. In addition to the 15 Teaching Aids listed above, you'll also get an animated (or static) Asheford approved, "Graduation Seal Of Completion" (just like the one to the left), which can be placed on your website to indicate to customers and clients alike, that you've completed the Asheford Program, and that you're a "graduate member" in good standing with the Institute.